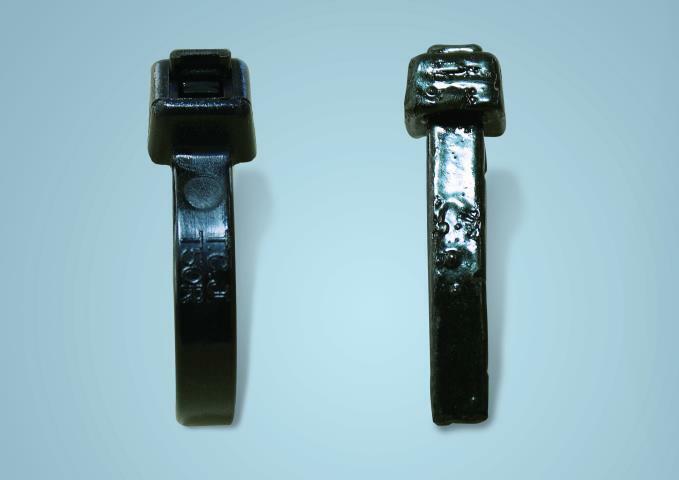 HellermannTyton has performed accelerated laboratory tests on Polyamide materials in a saturated zinc chloride solution that demonstrate the pronounced deterioration of Polyamide 6.6 (Nylon), which is the main material used in most conventional cable ties. A cost-effective solution to this dilemma is the GalvaLok series of cable ties manufactured from Polyamide 11 (PA11). Solar applications demand components for reliable operations that can withstand the elements and the tests of time. Maintenance after several weeks is unacceptable. Installation components should ideally last for decades. Update: in 2017 in Europe we changed the name from GalvaLok to the PA11 series. The GalvaLok brand name is widely known in Asia and has been retained there for our cable ties made from polyamide 11. The Polyamide 6.6 material reacts under prolonged exposure to solvents and starts to disintegrate dramatically within only a few weeks. The chemical reaction between the salt (chloride content), the zinc on the plated steel and water in the atmosphere produces a solvent that makes Polyamide 6.6 a poor choice in coastal installation environments. Due to its markedly reduced reaction to chemical solvents, Polyamide 11, which is derived from sustainable castor oil sources, is consequently a reliable choice for the bundling and fixing of solar cables to galvanised steel frames installed in coastal areas, where there are high concentrations of salt in the atmosphere. It is also ideal in areas where snow-melting chemicals are sprayed or for industrial areas with high local atmospheric concentrations of sulphuric gases. In addition, PA11 material boasts high resistance to UV radiation, which was demonstrated in a Fraunhofer ISE test conducted in Germany in 2013 (see previous blog article: UV stability of HellermannTyton Products tested by Fraunhofer ISE).